The Atlanta Falcons may have just surrendered their three-win streak to the Cleveland Browns in disappointing fashion, but they can establish a new run if they defeat the Dallas Cowboys on Sunday. Never in their history have Atlanta won three home games against the Cowboys in succession, but they’re on the brink of breaking that duck—52 years after their inaugural meeting against the Texas franchise. Coach Dan Quinn’s side was bested 28-16 in their trip to Cleveland last time out and sit third in the NFC South. They’ve beaten the Tampa Bay Buccaneers and the New York Giants in their last two home outings, but morale will be dented by their fall to quarterback Baker Mayfield & Co. The 6/4 (2.50) Cowboys, meanwhile, were boosted after clinching their first road win of the 2018 season at Lincoln Financial Field last Sunday, when they beat the Philadelphia Eagles 27-20. The Falcons did win three successive regular-season home matchups against the Cowboys between November 1976 and December 1990, but they lost a divisional playoff on their own soil in January 1981. Atlanta can set the three-victory streak in earnest in Week 11 and achieve something they never have against their NFC East opponents, who have beaten the Falcons in 14 of their 25 regular-season encounters. 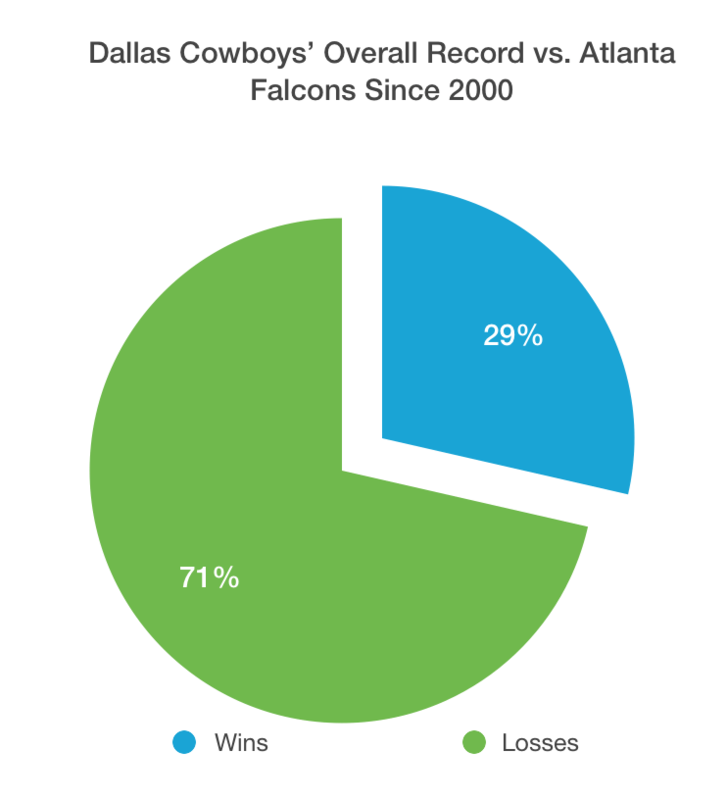 Dallas enjoyed a lot of their historical success against Atlanta during the first half of their rivalry, too, but have allowed results to slip more so in years gone by. The Cowboys have won fewer than a third of their seven fixtures—home and away—since 2001. Atlanta has outscored coach Jason Garrett’s side 181 points to 149 in those seven clashes, though they’ve scored only 46.4% of those points (84) in their four home matches and have been more prolific in Dallas. Sunday’s matchup will be a decisive point between two teams with identical records, and Atlanta should set a new franchise first in their history against Dallas.